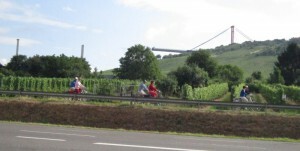 We had another fabulous ride along the Mosel Radweg today, in cool overcast conditions. We did 113 km from Bernkastel-Kues to Winningen. This was possible because of the ease of the route, being mostly flat or a gentle downhill. This is one of the best cycle routes that we have ever ridden, up there together with the Loire Valley and the Danube routes. The highlights of the ride are beautiful old villages that are full of character. Every now and then you spot an old castle on a hill top. 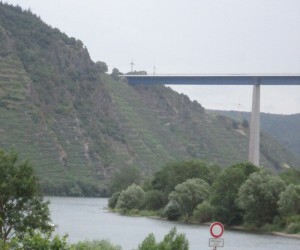 We were also impressed with the spanning arches of huge bridges across valleys. We saw a cable stay bridge under construction, being elevated at least 100m up. The most scenic part of today’s ride was through the river bends before Cochem, where we stopped for some juice and ice cream around midday. 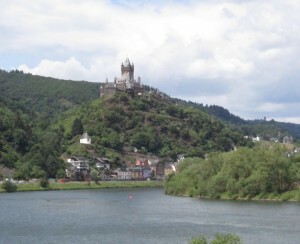 Another picture perfect town with a castle on a hill above the river. The character of the valley really comes out through its vineyards – which we continued to see along the whole route again today. According to this cartoon, they are the steepest in the world (and we believe it). Farmers have filled every spot on the hills. Some of them are so steep it is hard imagining anyone working on those banks. This bridge was near the end of the ride – it is huge but what is amazing is the vines, growing hundreds of meters up alongside the bridge. 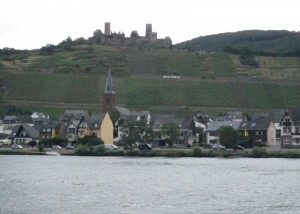 We stopped at Winningen, just short of Koblenz as it looked like a nice little town, just in the bend of the river – and we were getting tired. The tourist info was open and found us excellent accommodation in a bed and breakfast nearby. 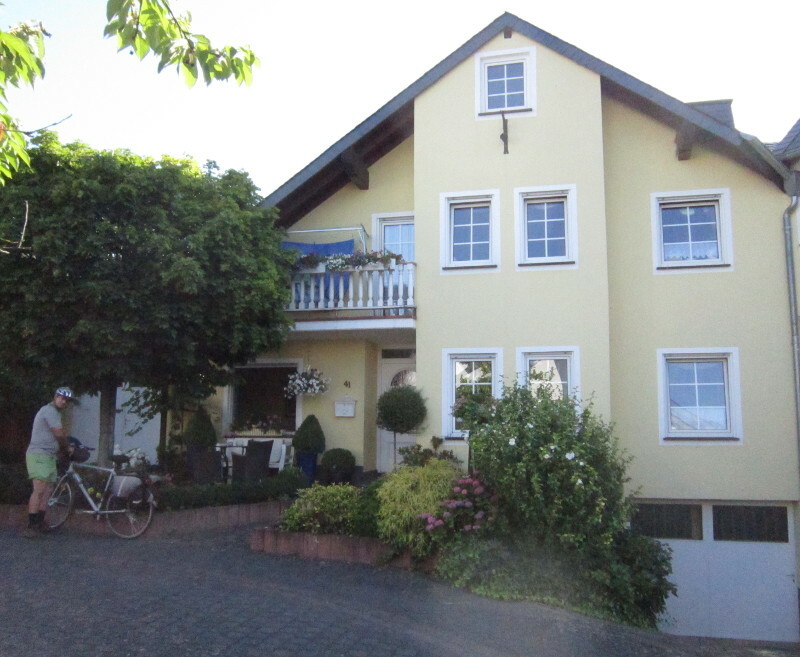 She has a large well kept home with two rooms to hire out on the ground floor, totally separate from the rest of the house and very comfortable. 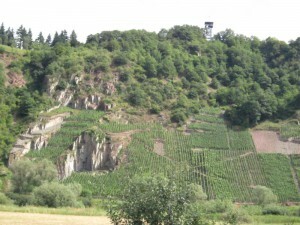 I read in Wikipedia that this region does indeed have the steepest vineyard in the world – the Calmont vineyard at 65 degrees incline! Obviously it is all manual tending of the vines and the region is known for fatalities of vinedressers!! Looks like you are in a great area for cycling – well set up with tracks and accommodation. Is it mainly German speaking where you are? i.e. many can’t speak English. I am thoroughly enjoying following your travels via this blog. Your photos and commentary are really interesting – thanks for doing it. Good luck to both of you in the coming weeks and hopefully the weather won’t be so hot. Here in ChCh so far this winter in ChCh, we’ve had twice the usual number of sub zero nights. Quite a few at -5C, feels like -7. Where and when will you complete your trip? Yes, it is all German speaking – the younger people can mostly speak English, but the older people cannot. Luckily Kris can converse in German which makes it easier. 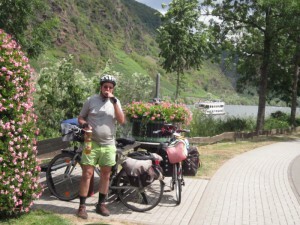 Generally we find Germany very easy for travelling, with great infrastructure for cycling. At the moment we are travelling along the Weser river to the north sea, then we will do a little tour of Holland. We want to visit family in England in August, so we will probably be finished with the cycle tour in a couple of weeks. We fly our of Amsterdam.